Anaheim, Calif. – August 13, 2015 – R.D. Olson Construction today completed construction on the six-story, 221-room Courtyard Anaheim Theme Park Entrance hotel in Anaheim, California, adding to the growing list of completed projects for the Irvine-based general contractor. The property will provide additional family-friendly capacity as the Disneyland theme park celebrates its 60th anniversary this year. This project marks R.D. Olson Construction’s second Marriott brand hotel completion this summer. The general contractor recently completed the 170-room SpringHill Suites by Marriott hotel in Burbank, California. 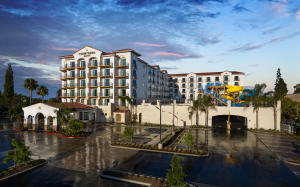 “This project allowed us to utilize our experience across Marriott properties, such as the Courtyard by Marriott Irvine Spectrum and the SpringHill Suites by Marriott in Burbank, as well as our applicable work building hotels with innovative, family-focused features such as LEGOLAND® Hotel in Carlsbad,” said Bill Wilhelm, president for R.D. Olson Construction. The Courtyard Anaheim Theme Park Entrance hotel is located at 1420 South Harbor Boulevard in Anaheim, and is within walking distance to the Disneyland theme park. The Courtyard Anaheim Theme Park Entrance hotel showcases subtle Spanish architecture with family-friendly features such as bunk beds, spacious five-fixture bathrooms in each guest room, a 22,000-square-foot surfing themed water recreation park with slides, water cannons and tipping buckets, and 50,000 square feet of subterranean parking. The property also offers Alpine-inspired views of Disneyland’s Matterhorn ride, as well as a pool and spa, outside dining space, lounge, gift shop and meeting space. The property includes Courtyard by Marriott’s latest high-tech, high-style Gen Next design features, including welcome pedestals that replace the traditional front desk, an interactive GoBoard™ to display news, weather, traffic, and destination information, and semi-enclosed Media Pods with individually controlled flat-panel TVs that offer a place to work, meet or relax. R. D. Olson Construction is currently under construction on nearly 1,000 rooms in Southern California. Other regional hospitality projects include the 144-room Residence Inn by Marriott in Old Town Pasadena, California, the 94-room Hampton Inn & Suites in Glendale, California, the 161-room Homewood Suites in Irvine, California, the 174-room Country Inn & Suites by Carlson in Anaheim, California, the 100-room luxury Bicycle Casino Hotel in Bell Gardens, California, and the 250-room, beach-inspired Paséa Hotel & Spa in Huntington Beach, California, situated across from the famous Huntington Beach Pier.